New Delhi : This Valentine's week, there will be a big sale of rare heart-shaped meteorite. Are you interested? Yes, Christie has announced the auction of 9-inch long meteorite between Feb 6 and Feb 14, just in time for Valentine's Day. The rare meteorite originated from one of the greatest meteorite showers in several thousand years. The heart-shaped meteorite which is up for sale was once a part of the massive iron mass that detached itself from the asteroid belt and glided through space before landing in Sikhote-Alin Mountains, Siberia, on Feb. 12, 1947. The large meteorite broke into smaller meteorites and blazed over Siberian mountains in a fireball that was as bright as the sun. An auction house website notes that the iron mass explosion disintegrated chimneys, shattered the windows, and uprooted the trees. A 20-mile smoke trail was seen covering the sky for hours, while sonic booms could be heard as far as 200 miles following the crash. "Many of the resulting meteorites produced impact craters as large as 26 meters [85 feet] — with nearly 200 craters having been catalogued," the auction house added. 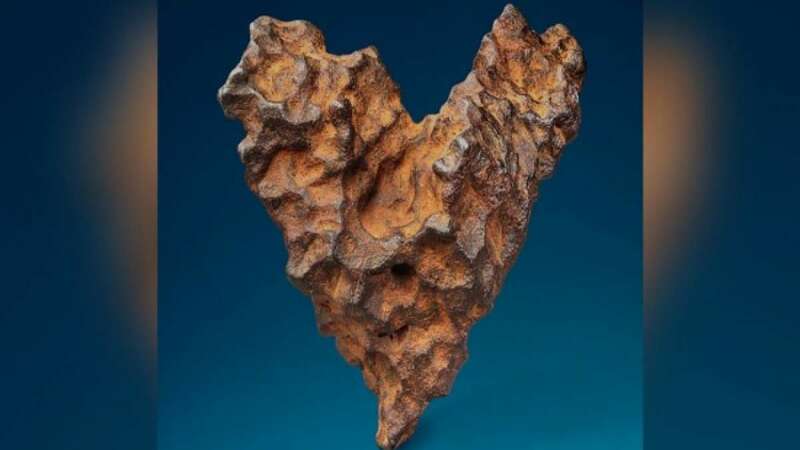 Christie's explains that not all meteorites found has the "heart of space" attractive design, The ones that broke away from the main body at a lower altitude are twisted and uneven, looking more like shrapnel than a desirable heart-shaped artifact. Sarah Crowther, from School of Earth and Environmental Sciences, University of Manchester, told CNN that "heart of space" belongs to a rare group of iron meteorites known as IIAB. "There are currently 134 type IIAB iron meteorites, out of a total of over 60,000 known meteorites, so this type is fairly rare," Crowther said. She also added that for an iron meteorite, the price is rather high. Other pieces belonging to the same meteorite cost in the range of $1 to $4 per gram. The high value of this meteorite can be attributed to its unique shape, the regmaglypts, and the size of the specimen, Crowther explained. The auction house expects to sell "heart of space" for somewhere between $300,000 and $500,000.